Remember I said I wasn’t one to give up easily? Obviously I am far from a professional cake pop-er like Bakerella so I thought you all would appreciate seeing my dipping… ahem… mishap… from first time. Oh who am I kidding? I still heart Sanrio. Hello Kitty and Kerokerokerropi POPS! 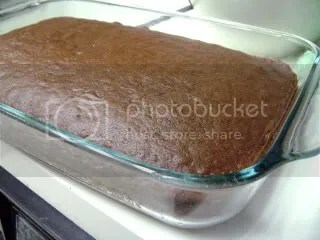 Bake a 9×13 cake from a mix or from scratch and cool completely. 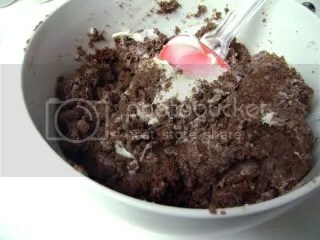 Crumble cake into a fine consistency into a large bowl. 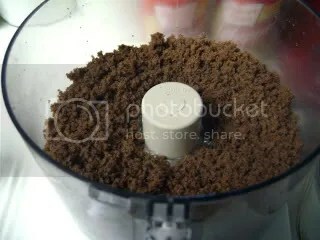 To make it easy, you can run it through a food processor. 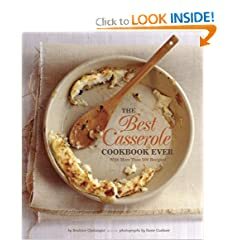 Add a can of cream cheese frosting. Blend thoroughly. 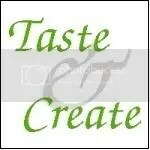 Melt white and green candy melts per package instructions in large bowls. (Melt as needed b/c it hardens the longer it sits.) 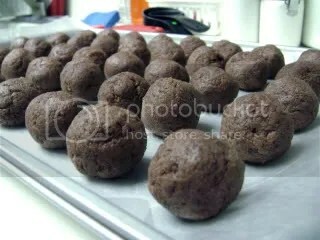 Remove the oval cake balls from freezer and prepare another wax paper covered cookie sheet. 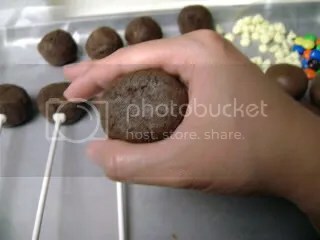 Dip end of lollipop stick into the melted chocolate before inserting into chocolate bottoms. Insert the lollipop sticks. Continue with rest of the pops. I used a long cup to dip. Made it much easier than a bowl for me. Make sure it’s a microwave safe cup though. You might have to nuke the candy melt again mid-dipping. 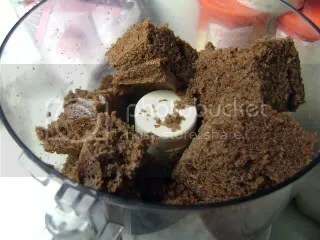 Let chocolate set completely, about 15-20 minutes. 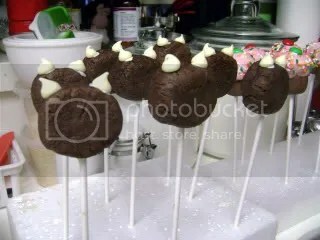 Attach 2 white chocolate chips to the top of cake pop for “ears”. Let set upright in a styrofoam block. 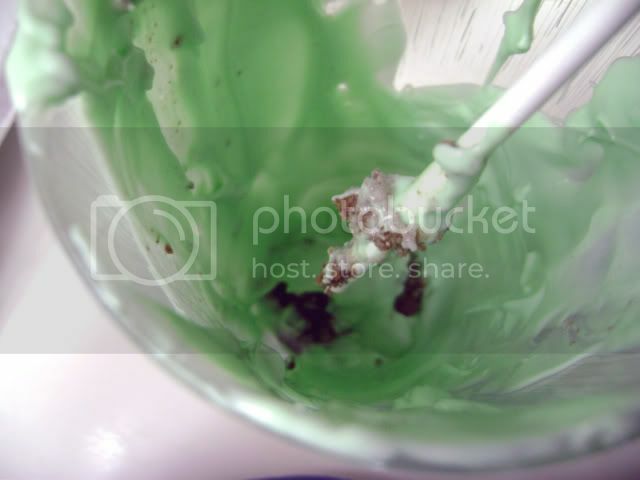 Dip the cake pop into melted white candy melt. Rotate and let excess chocolate drip off. Let set. Attach 2 jumbo hearts and red M&M for bow and yellow circle sprinkle for nose with a little melted candy melt. Let set. To create the eyes and whiskers, draw freehand with food safe marker. 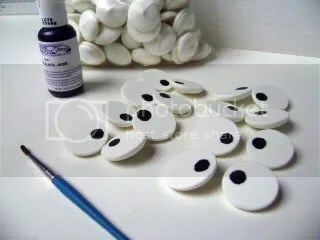 Make eyes out of reserved white candy melt disks and food safe marker. 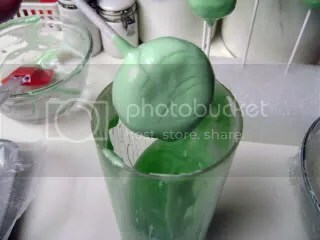 Dip the cake pop into melted green candy melt. Rotate and let excess chocolate drip off. Let set upright in a styrofoam block. Attach eyes and pink circle sprinkle (for cheeks) with a little melted candy melt. Let set. Draw mouth with food safe marker. To complete the presentation, cover the cupcake pops in a little plastic bag and tie with a ribbon. He was impressed with how much they looked like the characters but insisted that I should have used red velvet instead of chocolate cake. Sheesh. 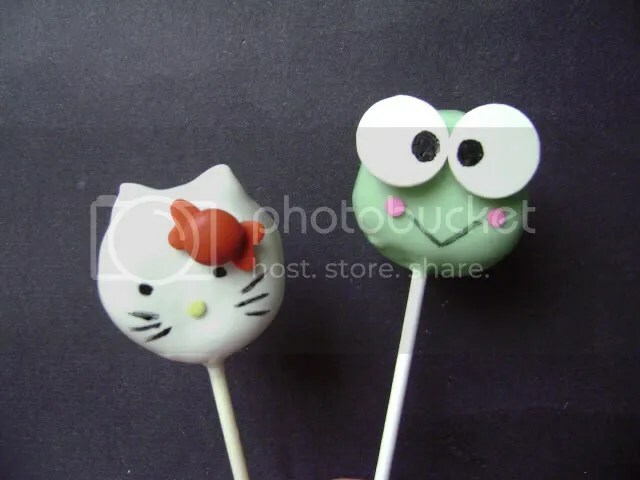 I think my Hello Kitty and Keroppi pops turned out pretty darn cute. Next time I’ll probably splurge on the mini red M&Ms for the bow but the regular was a good substitution too. My CW told me that her daughters ADORED the Hello Kitty pops and didn’t want to eat them. Eventually they did and loved the cake+frosting+chocolate combination. And I *think* I heard myself say I’d make 80 pops for her daughter’s birthday next month… eek!! Entry filed under: cake. 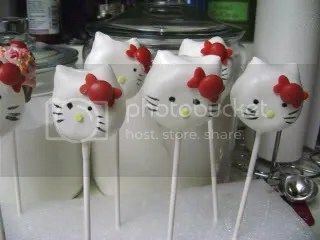 Tags: cupcake pops, hello kitty, kerokerokerropi. these are just about the cutest things ever!! adorable! I haven’t seen him since Korea!! I LOVE HIM! My Aunt nicknamed me “Toady” when I was little. And the frog collection that ensued is outta control! Good think my hubby doesn’t mind! These are awesome. You ROCK! I have to admit the frog came out pretty darn cute. I love the pink cheeks. I think that made it for me. Awesome job. I keep telling myself I am going to try these one day and then I always lose my nerve. Kudos to you for trying again, they look great! damn. these are too cute! great job. i love hello kitty too! So cute Clara!! The frog is adorable!! Thanks Neeners! I am partial to the frog too. Dang CB… taking s back in time. A blast from the past. I love it! Thanks for taking me back to my childhood. I love Sanrio characters. I know right? I was thinking I might have to do Pochacco next time. Yeahhhhh! You got it baby! Those are absolutely delightful! bravo! LOVE the pops! You did a fabulous job. ah shucks. You’re making me *blush*. The eyeballs are ginormous huh? I am loving the pink little cheeks myself. Well the second effort was definately worth it! They look great. I am adding “pops” to my “gotta try it someday” list. Awesome! You are officially a pop-over-achiever! Oh.. I love Kitty Chan, you did a fabulous job by her!!!! too cute…i’m almost sold on this whole cake pops thing. 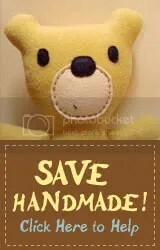 i will have to make them very soon! You should! They take some time but they are very fun.